Does Instant Oatmeal Have Less Fiber Than Rolled Oats? Oatmeal is highest in fiber when it is least processed, such as the rolled oats shown here. 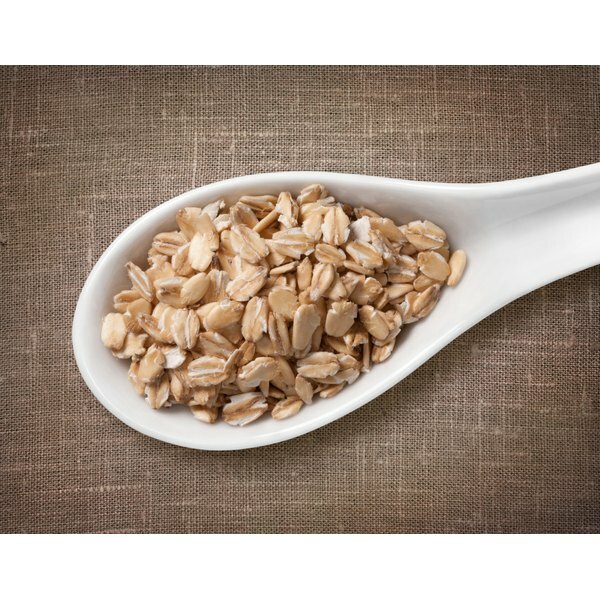 1 How Many Calories Do Oats Contain? Oats have more protein than any other grain and they supply lots of vitamins and minerals without excess salt or sugars. B vitamins are present in high concentrations in oats and, depending on processing, are available in oatmeal. But where oats really deliver is in the fiber content. The soluble and insoluble fiber in oatmeal is important for heart health and the digestive system. Whole oats have all three main parts of the grain. The outer layer, the bran, has most of the fiber, 50 to 80 percent of the minerals, phytochemicals and B vitamins. The endosperm is the largest part of the grain and contains fewer B vitamins, protein and the majority of the complex carbohydrates. The germ is power-packed with B vitamins, unsaturated fats, antioxidants, vitamin E, trace minerals and more phytochemicals. Most processed cereals include the endosperm but refined grains omit the bran and germ. A cereal may have all or part of the nutrients for each section of the grain and still be considered a whole grain, complete with healthy fiber. Both rolled oats and instant oatmeal are made from whole oat kernels once the tough, inedible hulls have been removed. Rolled oats are lightly rolled and quick-cooking oatmeal is flattened. 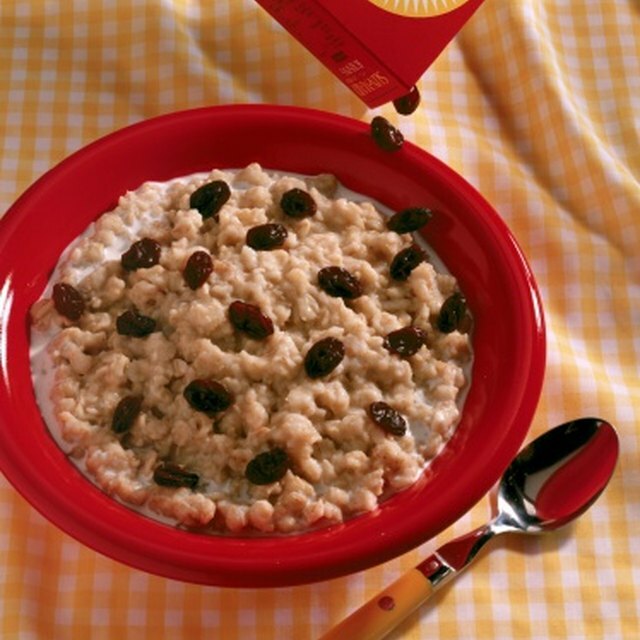 Instant oatmeal is made from the flattened processed oats, cut very small and further processed with several additives. The basic grain and its bran, endosperm and germ are present in both forms of cereal so they both contain fiber. The difference is in what kind and how much. Quaker makes several varieties of oatmeal products using different preparation methods so the fiber content for its brand of rolled oats and instant oatmeal make them easy to compare. The amount of fiber in each of the varieties reflects its processing. Quaker Old Fashioned Oatmeal is rolled and slightly flattened. It contains 4 g of fiber per serving: 2 g of soluble fiber and 2 g of insoluble fiber for a total of 13 percent of a daily fiber requirement. Soluble fiber attracts water and slows digestion so you feel fuller longer. Insoluble fiber bulks the stool and keeps the digestive tract moving. Quaker Oats Original Instant has 3 g of dietary fiber per serving but only 1 g of that is soluble fiber. Instant oatmeal provides 11 percent of the daily fiber requirement per serving. Both rolled oats and instant oatmeal contain soluble fiber which lowers your cholesterol level and contributes to healthy digestion and better nutrition. Your choice may reflect taste preference or convenience but there are other considerations. Johns Hopkins School of Public Health recommends raw rolled oats for breakfast. Rolled oats not only provide more fiber than instant oatmeal, they are also cheaper, can be bought in bulk to save on packaging and have less sugar than more processed oat cereals.